Transfer stamped or embossed images onto difficult surfaces using our Stamping Decals transfer paper. TO FIX TO GLASS, CERAMIC TILES, PERSPEX, AND SHINY SHEET METAL. For non-absorbent shiny surfaces, no glue other than the gum on the back of the transfer is required. Simply soak Lazertran in water and slide the transfer onto the carrier. Expel all air bubbles with a rubber squeegee and allow to dry for 24 hours. The image can be varnished for protection with both acrylic and oil based varnish. TO BAKE ON CERAMICS, GLASS AND METAL TO GIVE A HARD, WATERPROOF FINISH. Copy the image in reverse. 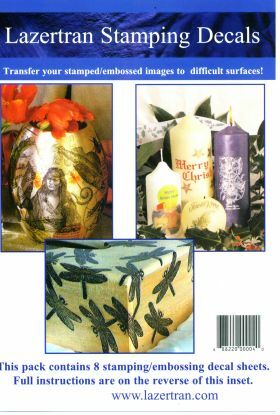 Put the sheet of Lazertran transfer paper with the images on in a hot domestic oven or use a heat gun to make sure the toners are completely fused on the paper before cutting and soaking in water. This will avoid small air bubbles later. Soak the transfer off and apply face down, toners next to the ceramics and wash away any gum on the surface of the decal. Then squeegee out any air bubbles. Put immediately into a domestic oven on the lowest setting for at least I hour then slowly increase the temperature as little as possible every 15 minutes until the image goes shiny like a glaze. This should take at least another hour. (about 200 degrees C gas mark 7) or 350-400 degrees F. The longer you take the better the result. INSTRUCTIONS FOR USING WATER BASED ADHESIVE METHOD. FOR PAPER OR CANVAS. 1. Stretch your paper or canvas over a flat board. Prime canvas with acrylic primer and for paper, seal with clear acrylic medium to avoid cockling and increase mobility of the transfer. Watered down P.V.A. may be used instead of acrylic. Note. Acrylic can be any good quality flexible medium, Liquitex, Spectrum, etc. 2. Trim your image to size and lower, into clean water. The paper will roll up. Allow to soak for a minute or so until the transfer releases. .
3. Apply a fresh coat of acrylic to the area you wish to fix the image, with a shorthaired roller. 4. .Lay the Lazertran onto the wet acrylic medium. Position, then slide out the backing sheet from under the transfer. Now squeegee out any bubbles. 5. Allow to dry flat overnight. Matt Acrylic can then be applied to give a flat finish. To apply over oil paint see Fixing with pure turpentine. PURE TURPENTINE METHOD. TO FIX LAZERTRAN DECAL PAPER TO PAPER, WOOD, STONE, PLASTER, LEATHER, PVC, AND DIFFICULT SURFACES WITHOUT ACRYLIC. 1.Trim your image to size and lower, wide edge first, into clean water. Allow to soak for a minute or so then pat off any excess water. 2. Soak your receiving surface with pure turpentine and slide the transfer onto the surface. 3. With a soft brush paint a little turpentine onto the surface of the transfer. Not too much or the transfer will break up. Leave to dry for several hours. 4. For putting over existing oil paint, wipe the painting or brush over with pure turpentine. Then lay transfer onto the surface. If too much turpentine is used the image will break up. Always lay flat till dry. n.b. Turps substitute or white spirit will not work. TO FIX LAZERTRAN TRANSFER PAPER TO VACUUM FORMING PLASTIC BEFORE FORMING. Lazertran can be used to put full colour images onto clear and opaque vacuum forms. 1. Soak the Lazertran as usual in water. 2. Slide off the backing paper and lay onto the plastic. 3. Remove all bubbles with a rubber squeegee and allow to dry. This is very important as any moisture under the transfer will boil and blow a hole in the image during forming. 4. When dry, put in former and bring up to temperature gently. 5. Form your plastic as normal. The image will weld into the plastic and will not split or crack. FOR HEAVIER FABRICS ordinary LAZERTRAN can be ironed on. But we now have a very good inkjet Textile paper that will give a great result. 1.Place Lazertran face down on the cloth. 2. Set iron to hot and iron onto the cloth until it is well stuck. 3. Wet the backing paper and peel off. Wipe away gum from image and allow to dry. 4. Place baking parchment, not greaseproof paper, over image and iron. Allow to cool then peel off baking parchment and repeat until the image sinks into the cloth. The more times you repeat this stage the better the result. LAZERTRAN DECAL PAPER AS AN ETCH RESIST. Some new colour photocopiers have toners that dissolve in turpentine so we have introduced a new solvent to remove the decal. Isopropyl Alcohol (used as a rubbing alcohol) is much more user friendly. It is also known as I.P.A. 2-Propanol, or Isopropanol. It is available at your Pharmacy. 1.Copy image in black and negative using a colour photocopier onto a sheet of Lazertran. Now you should make sure the toner have been melted onto the lazertran properly by putting the sheet into a hot oven. In a short time the black toner will go shiny. This will avoid bubbles forming later in the method. Now cut to size of your etching plate. 2. Soak in water, for a minute or so, then place the transfer, image side down, onto the degreased plate, slide off backing paper, then, using a soft rubber squeegee, expel all air bubbles, creases and moisture. 3. Put in a domestic oven set to its lowest temperature and leave for a least one hour. After this slowly increase the temperature as slowly as possible until the transfer melts and gets shiny, then allow to cool. This will take at least another hour. The first 100 degrees are crucial and must not be rushed as this can cause bubbling. The longer you take the better the result. 4. Wash away the decal using Isopropyl Alcohol leaving only the toners on the plate. You will feel the clean metal under your fingers. All traces of the slimy decal must be removed. 5. Lift out and carefully wash off the Isopropyl Alcoholin warm soapy water. An aqua tint can now be applied if required. You are now ready to etch. Before printing remove toners with solvent, or heat until melted and wipe off with rag and white spirits. (Nail polish remover or wintergreen oil work well). Note. This method can also be used on glass and metal if you want a full colour image and wish to remove the decal.